Welcome to the Future Everyday Technology Research Lab (FETLab) at the Rochester Institute of Technology. The focus of our research is on making the tools of digital fabrication—like 3D printing and laser cutting—accessible to non-experts, and on improving the usability of wearable and mobile computing devices. As ofJune 1, 2018, Dr. Ashbrook has moved to the University of Copenhagen. The FETLab at RIT has been closed; however, Dr. Ashbrook continues the FETLab’s research in Denmark. Please see his personal web page for current activities. Research in the FETLab focuses on two main areas: augmented fabrication and wearable computing. To help people better use digital fabrication technology, we want to understand the problems they’re running into now. We’re doing ethnographically-inspired research into how current users of 3D printers are using their devices, what problems they run into, and how they’re overcoming those problems. Currently, we’re looking at the e-NABLE community—a worldwide group of volunteers who 3D print prosthetic hands for kids—and how its volunteer fabricators design, customize, print and assemble the hands. Right now it’s easy for anyone to download and print a pre-designed object from Thingiverse, but designing an object to make it personal is a lot harder. We’re working on tools to help novices customize and print their own Internet-connected objects, from a bird that chirps for Twitter notifications to a box that sends a text message when the washing machine’s done. Digital fabrication can be tricky. Whether making an entirely new object with a 3D printer or modifying an existing object with a laser cutter, lots of specific knowledge is required. We’re working on building new hardware and software tools to help people more quickly and easily design for fabrication. Examples in this area include connected tools for measuring existing objects, in-situ design and preview for laser cutting, and automatically changing settings for fabrication based on the material to be used. 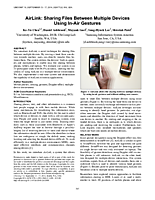 How can we quickly interact with our devices? We invent new methods for doing input and output with wearable devices. Previous work we’ve done in this area includes rings, watches, pendants, bands and gestures. We’re currently investigating non-speech-based hands-free microinteraction input techniques. 2017 Michael L. Rivera, Melissa Moukperian, Daniel Ashbrook, Jennifer Mankoff, Scott E. Hudson. 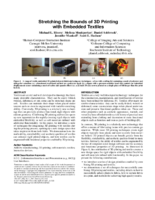 Stretching the Bounds of 3D Printing with Embedded Textiles. In CHI 2017: Proceedings of the 35th Annual ACM Conference on Human Factors in Computing Systems. 2017 Jeremiah Parry-Hill, Patrick Shih, Jennifer Mankoff, Daniel Ashbrook. 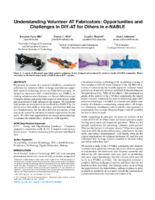 Understanding Volunteer AT Fabricators: Opportunities and Challenges in DIY-AT for Others in e-NABLE. In CHI 2017: Proceedings of the 35th Annual ACM Conference on Human Factors in Computing Systems. 2016 Daniel Ashbrook, Carlos Tejada, Dhwanit Mehta, Anthony Jiménez, Goudam Muralitharam, Sangeeta Gajendra, Ross Tallents. Bitey: An Exploration of Tooth Click Gestures for Hands-Free User Interface Control. In MobileHCI 2016: ACM 18th International Conference on Human-Computer Interaction with Mobile Devices and Services. 2016 Daniel Ashbrook, Shitao "Stan" Guo, Alan Lambie. 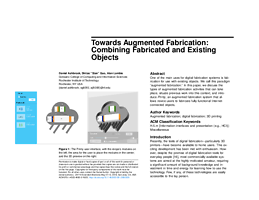 Towards Augmented Fabrication: Combining Fabricated and Existing Objects. In CHI 2016 EA: Proceedings of the 34th Annual ACM Conference Extended Abstracts on Human Factors in Computing Systems. 2014 Ke-Yu Chen, Daniel Ashbrook, Mayank Goel, Sung-Hyuck Lee and Shwetak Patel. AirLink: sharing files between multiple devices using in-air gestures. 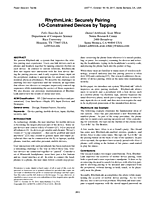 In UbiComp '14: Proceedings of the 2014 ACM International Joint Conference on Pervasive and Ubiquitous Computing, pp. 565--569. 2013 Kent Lyons, David H Nguyen, Shigeyuki Seko, Sean White, Daniel Ashbrook and Halley Profita. BitWear: a platform for small, connected, interactive devices. In UIST '13 Adjunct: Proceedings of the adjunct publication of the 26th annual ACM symposium on User interface software and technology, pp. 73--74. 2012 Kent Lyons, David Nguyen, Daniel Ashbrook and Sean White. 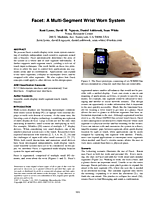 Facet: a multi-segment wrist worn system. In UIST '12: Proceedings of the 25th annual ACM symposium on User interface software and technology, pp. 123--129. 2012 Ryan McGee, Daniel Ashbrook and Sean White. SenSynth: a Mobile Application for Dynamic Sensor to Sound Mapping. In International Conference on New Interfaces for Musical Expression, pp. 1--4. 2011 D Kohlsdorf, T Starner and Daniel Ashbrook. 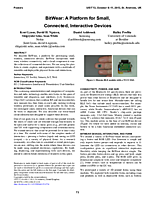 MAGIC 2.0: A web tool for false positive prediction and prevention for gesture recognition systems. 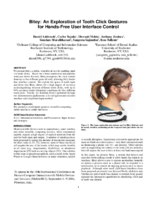 In Automatic Face & Gesture Recognition and Workshops (FG 2011), 2011 IEEE International Conference on, pp. 1--6. 2011 Daniel Ashbrook, Patrick Baudisch and Sean White. 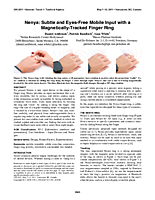 Nenya: subtle and eyes-free mobile input with a magnetically-tracked finger ring. 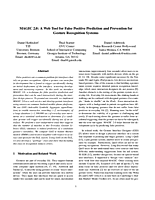 In CHI '11: Proceedings of the SIGCHI Conference on Human Factors in Computing Systems, pp. 2043--2046. 2011 Felix Xiaozhu Lin, Daniel Ashbrook and Sean White. RhythmLink: securely pairing I/O-constrained devices by tapping. 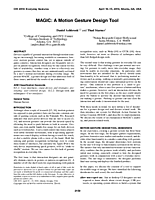 In UIST '11: Proceedings of the 24th annual ACM symposium on User interface software and technology, pp. 263. 2010 Daniel Ashbrook and T Starner. MAGIC: a motion gesture design tool. In Proceedings of the SIGCHI Conference on Human Factors in Computing Systems, pp. 2159--2168. Daniel Ashbrook is the director of the Future Everyday Technology lab. His work concentrates on democratizing access to digital fabrication and wearable technology. Carlos E. Tejada is a Ph.D. student with the Future Everyday Technology Lab. Zhiyuan Li is a PhD student at the Future Everyday Technology lab. His current interest lies in computer vision and personal fabrication. Chandan Mahapatra is a UX Researcher at the FETLab. Jeremiah Parry-Hill is an MS candidate in Human-Computer Interaction at RIT. His research focus is on the work practices of amateur fabricators. Sangram Pawar is a graduate research assistant in the FETlab. His interest lies in interaction design, web development and prototyping. James Spann is an undergraduate research assistant. Michael Longley is an undergraduate research assistant in the FETLab. Osamu Fujimoto is an undergrad in Computer Science with the Future Everyday Technology Lab. Peregrine Hawthorn is an undergraduate research assistant in the FETLab. The Future Everyday Technology Research Lab is a part of RIT’s B. Thomas Golisano College of Computing and Information Science. To contact an individual, please see each person’s information above. We are located on RIT’s campus in room 2330 of the B. Thomas Golisano College of Computing Information Science building, labeled GOL on the map below. Once you arrive at RIT, visit the Welcome Center (WEL on the map) to get a temporary parking permit; you may then park in any non-reserved space. The closest lots to the FETLab are J and S.